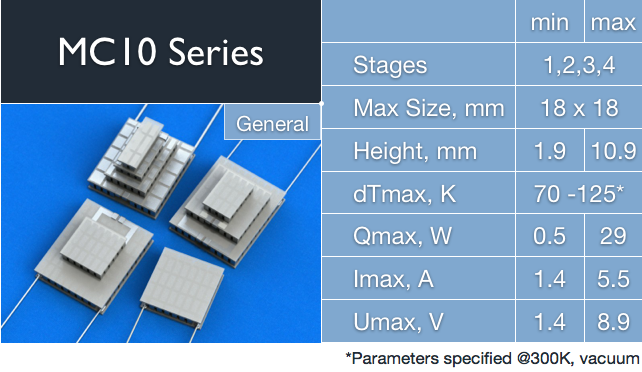 RMT manufactures a wide range of TE coolers from miniature to high power modules, single stage and multi-stage types, different DC current values, all with unique custom parameter options. There are more than 1500 standard types of thermoelectric coolers available. Cold sides range from 1 x 1 mm² to 18 x 18 mm², maximum current ranges from 0.2 to 6 Amp, dTmax - from 70°C in single stage up to 130°C in multi-stage configurations (specified at 27°C, vacuum). 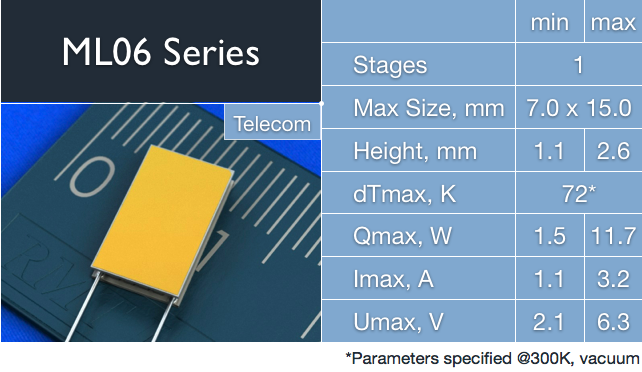 Depending on size and performance all TE coolers are divided into several Series. We recommend the software TECCad for optimal thermoelectric cooler selecting and analysis at different conditions, or our On-Line TEC Select Assistant for fast search and selecting of the type you need for your application. You’re also welcome to contact us – we would be glad to assist you. Hint: The decision which thermoelectric cooler to apply - from MC04, MC06 or MC10 Series - depends a lot from application. 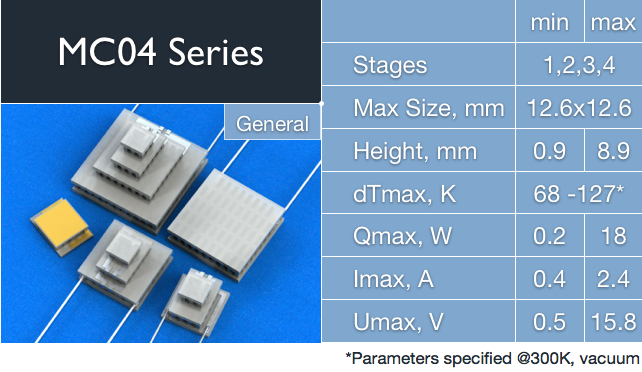 Some TECs from MC04, MC06 and MC10 Series may have similar dimensions, but different performance parameters. The best choice depends from application conditions and requirements. Please, contact RMT Ltd to get the precise estimations for your application or use TECCad (Windows) or iTECPad (for iPad) software. Thermoelectric cooler of MD Series are based on RMT HD pellets technologies with high density pellets placement. MD04, MD06 and MD10 Series are based on HD technology with about 250 pellets per 1 cm2 density. MD03 Series of low current TECs is developed specially for cooled TOSA applications and is based in RMT advanced HD technology (more than 400 pellets per 1 cm2). MD02 Series has a range of TEC with 1100 pellets per 1 cm2. MD015 Series has a unique combination of a miniature cross section of pellets and a distance of 100 μm between them, which allows the density of 1600 pellets per 1 cm2. Each TEC Series has its own advantages depending on application conditions and requirements. MD Series thermoelectric coolers are based on RMT high-density pellets placement technology. The distance between elements is reduced, comparing with regular technology TECs. This allows to reduce the size of thermoelectric cooler keeping the same performance as regular type, or to increase the cooling capacity up to 100% with the same size as regular TEC has. 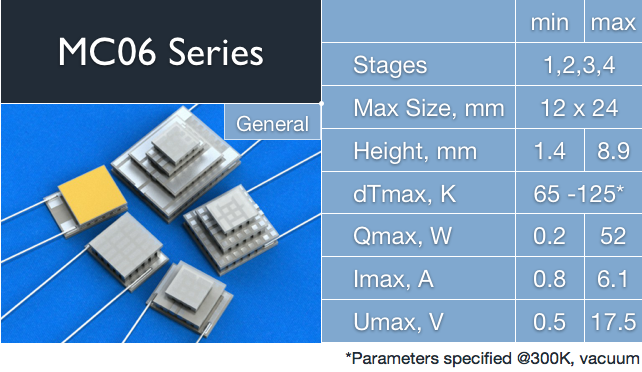 There are six MD Series available: MD015, MD02, MD03, MD04, MD06 and MD10. 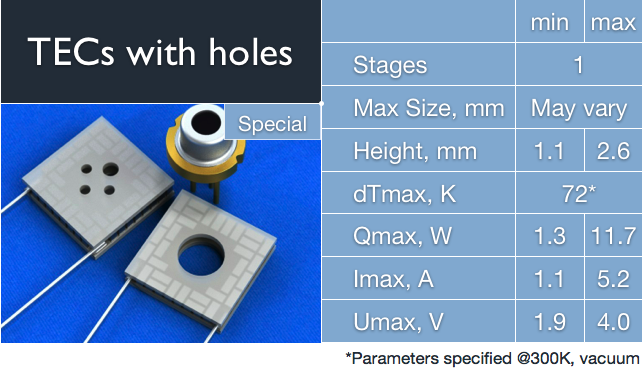 The difference between series is in internal pellets cross section, performance parameters range and overall dimensions. 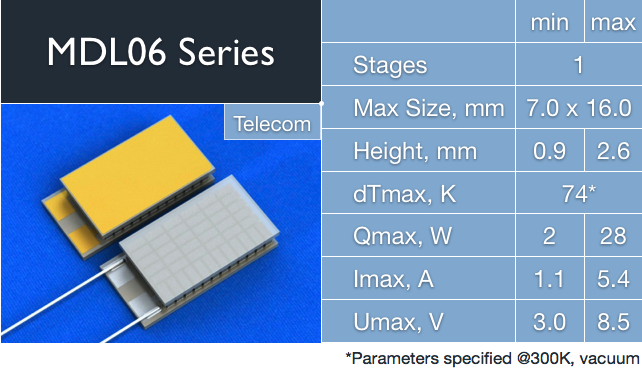 MDL06 Series of thermoelectric coolers is developed for telecom applications. It is the analog of regular ML06 Series by main geometry, but MDL06 TECs have up to 100% higher cooling capacity. MDL06 TECs are based on RMT high-density pellets placement technology that allows to fit more BiTe elements on the same size as regular TEC types. Thermoelectric coolers are available on standard 0.5mm ceramics (Al2O3 or AlN) and thin 0.25mm ceramics. Thermoelectric coolers with holes can be used for “external” cooling. Term “external “ cooling means TEC attached to the entire assembly with a header, rather than to heat-generating object. There are two typical cases where thermoelectric coolers with holes can be used: 1) powerful LD on TO-46/TO-56/TO-9 headers with not enough space to mount TEC on a header, 2) already sealed (un-cooled) devices, where the advanced temperature stabilization improves application performance. 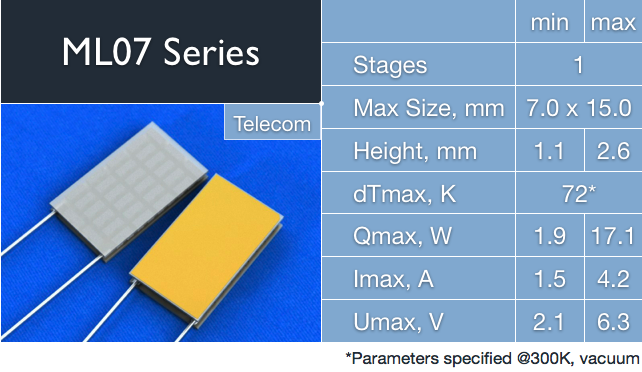 MDX Series TECs are developed by RMT separately to general 2-stage thermoelectric coolers. MDX TECs have 2 stages and with the same dimensions for hot and cold sides, different to typical pyramidal shape of multistage TE coolers. There are two Series - MDX04 and MDX06. The difference is in internal elements cross-section and as a result - performance parameters and overall dimensions. 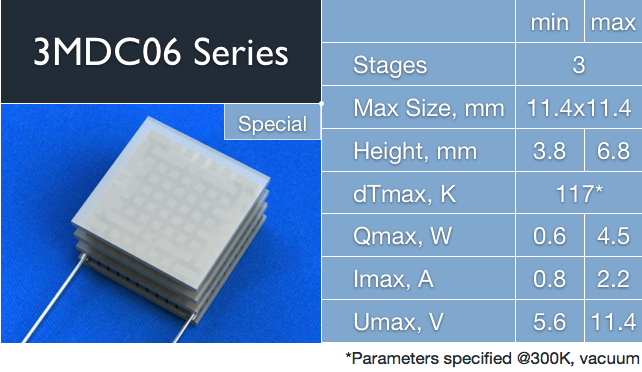 The optimal balance of parameters and additional flexibility in TEC height variations by ceramics thickness allow to replace single-stage TE coolers in sensing applications keeping the same geometry. 3MDC Series consist of 3-stage thermoelectric coolers with specially enlarged cold side area. 3MDC 3-stage thermoelectric coolers combine the standard RMT assembly technology and HD pellets placement technologies. The result is large cold ceramics area with the same size of TEC hot side. This is a key feature of 3MDC TE coolers, comparing with standard multistage TECs that have a pyramidal shape. 3MDC TECs are optimal for detector applications. 3MDC unique TEC shape also allows to form TE cooler arrays. New 3MDC TECs have up to 60% higher cooling capacity, comparing with typical solutions of the same size available on the market. The MX Group of thermoelectric coolers contains 2-stage TECs with enlarged cold side and special combination of Imax/Umax parameters. 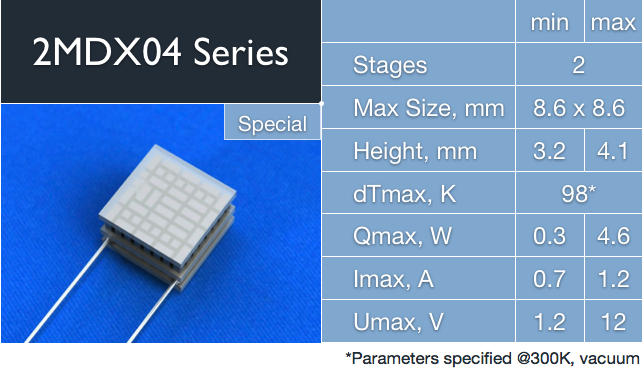 MX TE coolers are developed and optimized mainly for sensing applications (X-Ray and IR). Additionally to enlarged cold ceramics MX TECs have specific electrical connections inside. It is a special mix of serial and parallel connections of TEC internal elements that provides a unique balance between cooling capacity, dT and power consumption. Custom designed TE modules are available according to demanded specifications.